Capitol - Washington DC Brett Kavanaugh begins the confirmation process. 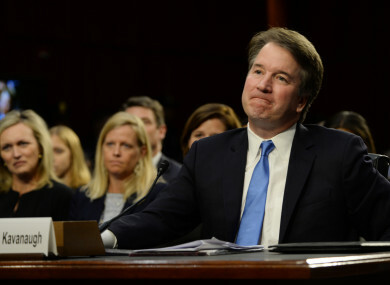 DONALD TRUMP’S US Supreme Court nominee Brett Kavanaugh defended his judicial independence, insisting in his first day of questioning in the US Senate that he would not be influenced by “political pressure”. For a second straight day, protesters repeatedly interrupted his confirmation hearing as senators grilled Kavanaugh over abortion rights, gun legislation and whether a sitting president can be compelled to respond to a subpoena. Kavanaugh’s loyalty to Trump has emerged as a point of friction, with Democrats voicing concern about the nominees views on the scope of presidential power, and the extent to which a commander in chief can or should be protected from investigation. Republican Senator Orrin Hatch bluntly asked Kavanaugh what loyalty he owes Trump. “I owe my loyalty to the Constitution,” Kavanaugh, a judge on the US Court of Appeals in Washington, responded, holding up his tattered personal copy of the document. “No one is above the law in our constitutional system,” including those in the executive branch, he told the Senate Judiciary Committee. In a footnote to a 2009 law review article, Kavanaugh wrote that “a serious constitutional question exists regarding whether a President can be criminally indicted and tried while in office”. A decade earlier, Kavanaugh wrote that the Constitution seems to dictate that “congressional investigation must take place in lieu of criminal investigation when the President is the subject of investigation, and that criminal prosecution can occur only after the President has left office”. As an example of precedent, he cited US v Nixon, the Supreme Court’s unanimous 1974 ruling that president Richard Nixon was required to comply with a subpoena seeking the tapes of his Oval Office conversations. In past comments, Kavanaugh has supported an expansion of a US president’s immunity from prosecution – a dramatic shift from his recommendation for strong action against then-president Bill Clinton when Kavanaugh assisted in a 1990s investigation against him. Asked today by veteran Senate Democrat Dianne Feinstein whether a sitting president can be forced to respond to a subpoena, he demurred. As a matter of canons of judicial independence I can’t give you an answer on that hypothetical question. The conservative Kavanaugh, aged 53, was tapped by the president to succeed retiring swing-vote justice Anthony Kennedy in a lifetime appointment. Should he win confirmation, Kavanaugh would be Trump’s second nominee to sit on the nine-member bench, and could solidify a hard-right court majority and help shape key aspects of American society for a generation or more. The hearing got off to a chaotic start yesterday, when Democrats sought to delay the proceedings over tens of thousands of pages of documents pertaining to Kavanaugh’s time in the George W. Bush White House, that have been withheld by the Trump administration. Republican Senator John Cornyn branded the chaos “mob rule”. Protesters, who repeatedly interrupted yesterday’s proceedings, did so again today. “Sham president, sham justice!” one woman shouted as police removed her from the hearing room. Kavanaugh appeared eager to present himself as a collegial and “civil” judge who treats all parties fairly, and he expressed a respect for the Supreme Court precedent of Roe v Wade, the 1973 decision that protects women’s rights to have abortions. Trump campaigned on a promise to nominate pro-life judges and justices, and Democrats worry that Kavanaugh will seek to overturn Roe. Republicans hold a one-vote majority in the Senate. Should a single Republican defect to oppose Kavanaugh, it could throw his confirmation into jeopardy, although there has been little sign that any GOP senator was prepared to buck Trump. The confirmation process takes center stage just two months before midterm elections that will decide whether Republicans maintain their control of both chambers of Congress. Email “Trump's Supreme Court candidate quizzed on his loyalty to the US President”. Feedback on “Trump's Supreme Court candidate quizzed on his loyalty to the US President”.